Raising confident, self assured children is incredibly tough. Our children are inundated with media messages about how they should act, look, eat and wear. It is heartbreaking to think that our little ones self worth can be influenced so much by a world of people they don’t even know. As parents the best we can do is help fill our little ones with the love and self confidence they need to feel secure enough to question all the influences out there and develop their own self worth and strong minds. What did your mum do with the very first drawing you brought home from school? She likely hung it on the fridge. Soon your fridge was covered in so many pictures you had trouble finding the door handle. Can you remember how proud you felt when it was there pride of place for everyone to see? Displaying these little accomplishments, bragging about them and praising our little ones efforts are beautiful little ways that we tell our children that their accomplishments matter. Their hard work matters. Rather than printing and displaying family photographs, families are increasingly sticking to enjoying the images in a digital form, be it a mobile device, Facebook or laptop. But does an image on a tablet, computer screen or social media site have the same impact for helping families boost a child’s self-esteem? How do we tell our kids that THEY matter? We tell them “I love you” which is important, of course, but that is all about YOU and what you feel. We tell them that they are wonderful, that they can do anything they set their mind to, we praise the products of their work and efforts, and we focus a lot on goals. That’s not the same as showing your daughter that she matters. It’s not the same as showing your son that he belongs. Why can’t their picture be stuck on the fridge right along side their other accomplishments? What message would your daughter get each and every morning if she walked down the stairs and saw a beautiful family picture at the bottom of the staircase? What would happen if you also displayed values along side accomplishments? There seems to be a little bit of research done to support this idea. 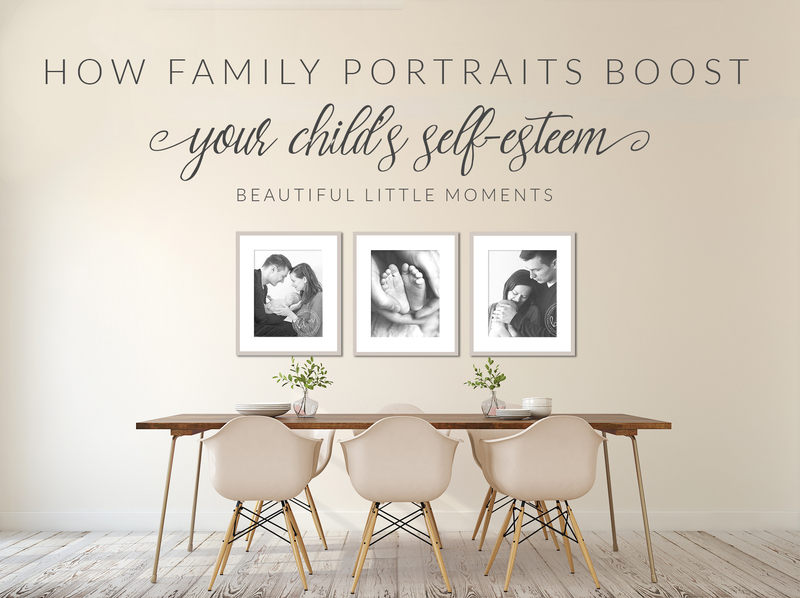 “Display accomplishments on the wall, along with pictures or other little momentos. It can be as simple as displaying artwork on the fridge, or as elaborate as setting up a trophy case. But your child should have his or her own place to go to when he is feeling down about himself. If all your important family pictures are on your cellphone, or computer, or worse, a DVD or USB drive stashed in a drawer somewhere, what message does that give your children about their importance and role in the family? Your little ones are precious works of art; growing, thriving, changing little people who deserve to be celebrated. Early in 2015 another article from Design Aglow was also circulating on social media, and way back in 1994, The Baltimore Sun also ran an article about similar research. Beautiful Little Moments Photography is a studio and on location photographer in Epsom, Surrey focusing on newborn photography and baby photography, serving clients from Epsom, Cheam, Chessington, Banstead, Ashtead and more. Contact me today to reserve your session or, explore more on Instagram and follow us on Facebook for promotions and previews.